This news is courtesy of IESB...20th Century Fox is still bathing in money from James Cameron's Avatar. At this point, we're talking dog toilet-paper bucks they've earned so much. So obviously a sequel is happening, right? Sure, but the waiting time for said follow-up looks to be a minimum of four years. Fox does have their fair share of comic-book properties getting the "Reboot" treatment and other sci-fi films such as the Predator and Alien franchises. But still the studio needs an honest-to-Christ event picture – something huge, something like.....wait for it......Independence Day. It seems that Godzilla is getting the remake treatment yet again. 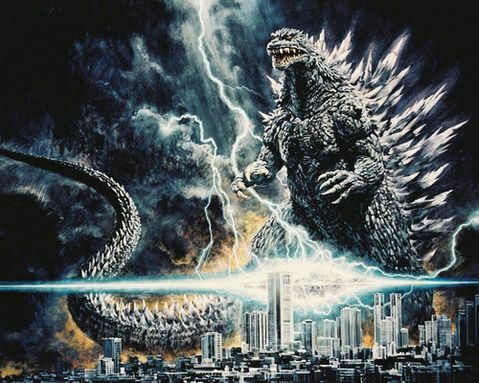 Just 10 years after the latest reboot, Variety is confirming the scoop that Bloody-Disgusting had last year..."Godzilla" is coming back -- this time, with Legendary Pictures taking the lead, co-producing and co-financing with Warner Bros. for release in 2012. This comes from HorrorBid. Scream 4 is gearing up for a move from California to Michigan. Here's HB's story...We learned today the studio has decided to shoot the film in Michigan instead of California, the state the 3 earlier films were shot. Why you ask? Are they all the sudden Wolverine fans? No, they simply are taking advantage of the "huge tax incentives" Michigan offers studios to shot their films at. Seems simple enough right? An exact location has yet to be confirmed but we will keep you updated as the latest news breaksThis is the first film in the franchise to be shot outside of California. Even though Scream 2 took place in Ohio, it was filmed in CA. According to Variety, Will Smith is deciding which film will be his next project. There's two choices: Men in Black 3 and The City That Sailed. The choice is obvious to me.Will Smith is pondering which ship he'll captain next. It's down to two choices: Sony's "Men in Black III" or 20th Century Fox's fantasy-adventure "The City That Sailed." Each project has particular appeal for the actor. Smith's production company Overbrook Films developed "City that Sailed" and brought it to Fox, which embraced the family property. Penned by Andrew Niccol, "City that Sailed" revolves around a New York street magician who is unhappily separated from his young daughter. The girl, who moves to London, finds magic candles that make her wishes comes true, with unintended consequences: The island of Manhattan separates from the continent and floats toward England, bringing her dad ever closer. There's no director yet on the project. TV Guide is reporting that Valentine's Day co-star Jamie Foxx is writing the script for the Laverne and Shirley movie. Here's the skinny...Remember all that silly talk during the press junket for the movie Valentine’s Day that Jennifer Garner and Jessica Biel would like to play Laverne & Shirley in a big-screen remake? I immediately filed that under the ‘will never happen in a zillion years’ folder. Well, Valentine’s and L&S producer Garry Marshall, who was honored at the 18th Annual Night At Sardi’s Fundraiser for Alzheimer’s (his mother died of the disease), tells me the script is now being written by Valentine’s co-star Jamie Foxx. Variety is reporting that Sony is prepping a 3-D Popeye flick. Um. Hell yes!Sony is bringing an all-CGI "Popeye" to the bigscreen, with the iconic sailor man's muscles set to pop in 3D. Avi Arad, who teamed with Sony to turn Spider-Man into a powerhouse franchise, is producing. Scribe Mike Jones is in negotiations to adapt. King Features Syndicate, which is owned by Hearst Entertainment and Syndication, controls the property and decided to bring it to Arad, who worked for years with Hearst president and former Marvel topper Scott Sassa. Popeye hasn't been seen on the bigscreen since 1980 when Robin Williams starred in a live-action version helmed by Robert Altman. This bit of interesting news comes courtesy of Moviehole...Michael Bay has roped in John Malkovich, Ken Jeong and Frances McDormand to "Transformers 3", the director announced via official website earlier today. Malkovich, who had been in advanced talks to play the villain in Sony's now-defunct "Spider-Man 4", will play Shia LaBeouf's "first boss" (says Deadline Hollywood Daily). McDormand, relatively new to Blockbuster-ville, will play the National Intelligence Director. No word on who funnyman Jeong, best known for his work in "The Hangover" and "Knocked Up", is playing. The flick, which will again star Shia LaBeouf and Megan Fox, kicks off it's pre-shoot next month. New York, NY (March 22, 2010) - Dimension Films is putting the finishing touches on its 2011 slate which focuses on continuing its most successful franchises. The first project to go into production this spring will be SCREAM 4, which Kevin Williamson is writing and Wes Craven has signed on to direct. Neve Campbell, David Arquette, and Courteney Cox Arquette will be reprising their roles from the original SCREAM installments. Joining the returning cast members will be a new group of young actors. The SCREAM franchise has grossed more than $500 million at the worldwide box office and ushered in a new wave of horror in the 1990s. SCREAM 4 will be released on April 15, 2011. This comes from The Hollywood Reporter. Chris Evans has been offered the role of Captain America.Chris Evans is one step closer to the role of Captain America. Sources tell us the actor, who once donned superhero garb in two "Fantastic Four" movies, has been offered the role of Captain America. Marvel has not confirmed the development and CAA, which reps the actor, declined to comment. B-D has the latest on the long-awaited third film in the Jeepers Creepers franchise. Ray Wise spoke to B-D, and this is how that conversation went...Last night Bloody Disgusting's Chris Eggertsen visited the set of Infestation director Kyle Rankin's latest, Nuclear Family, a thriller set in the backdrop of the apocalypse. While on set Chris had a chance to speak with star Ray Wise who updated him on the progress of Jeepers Creepers III, Victor Salva's long delayed sequel to his creature feature franchise started back in 2001. Now this is something that will most likely interest me: a 3-D spot-motion (claymation) Addams Family movie! Here's what Deadline Hollywood Daily is reporting...EXCLUSIVE: Alice in Wonderland director Tim Burton has found a new 3D project. He will direct a stop-motion animated film based on Charles Addams' original ghoulish cartoon drawings of The Addams Family. Illumination Entertainment, the Universal-based family film unit headed by Chris Meledandri, has acquired the underlying rights of the Addams drawings, once a staple of The New Yorker magazine. I think we all seen this coming. Warner Brothers is prepping the fourth sequel in the Final Destination franchise. Will this one, in fact, be final? Here's what Moviehole is saying...Despite the last one sucking worse than a $2 store vacuum cleaner, Warner Bros are preparing to grease the wheels on a fifth "Final Destination". Warner Bros. head Alan Horn told attendees of ShoWest, say Bloody Disgusting, that the studio just "couldn't resist" in greenlight sequel number four. "The Final Destination", the most recent entry in the teen-slasher series, was a big success for the studio when it was released last August. Producer Paul Maslansky spoke to MTV about the upcoming Police Academy sequel/reboot. This is what he had to say...While everyone was obsessing over the not-yet-aired Academy Awards show a couple weeks ago, I was running around in circles at the news that "Police Academy" was coming back. Not just that, but series producer Paul Maslansky was leading the charge to bring it back. This is very exciting news for me, as the "Police Academy" series is one that stands out in my formative experiences with film. This casting call list is from Moviehole...and I found it quite amusing and decided to share..."Pirates of the Caribbean : On Stranger Tides" is inching forward it seems (from the sounds of it, principal photography will commence in May/June) with casting agents desperately trying to hunt down some beauticious extras for a couple of crucial scenes. Tom Atkins Attached To Halloween 3? This interesting news is courtesy of our good buddies over at HorrorBid. Could Tom Atkins be attached to Halloween 3 (a sequel to RZ's H2)? Here's what HB had to say...There are a couple of problems with this story however. Halloween 3D is either not going to happen or more than likely happen with a different script. Rewind to last year when Rob Zombie's Halloween 2 hit the box office. The numbers weren't great and the film was getting panned by the critics. Regardless of that the Weinstein Brothers announced that there would be a third film (minus Zombie this time) and the director and writer of My Bloody Valentine 3D would be coming aboard to pen and direct the new film titled, you guessed it, Halloween 3D or H3D. In a matter of weeks that project got nixed for uncertain reasons and has been up in the air sense. This amazing news comes from Moviehole...The script for Jason Segel and Nicholas Stoller's "The Greatest Muppet Movie Of All Time" is Gold. It's classic Henson - top tunes, great gags, oodles of cameos (there's even an opportunity for Charles Grodin to reprise his 'Great Muppet Caper' character), and no goddamn literary cross-overs (you know what I mean - a 'Christmas Carol', 'Treasure Island' and so on). If you head on over to the official website for the new Predators flick, you'll find a cool little featurette on there that show a lot of behind the scenes production footage and a neat quasi-interview with Robert Rodriguez. Click here to check that out now! I've sort of been against the whole 3-D movement as of late, but this film I actually want to see in the third dimension! ComingSoon reports that the third film in the Chipmunks franchise will, in fact, be in 3-D. I look forward to it.20th Century Fox has announced that Alvin and the Chipmunks 3D, the third installment in the franchise, is coming to theaters on December 16, 2011. Combined, the first two films earned an impressive $791 million in theaters worldwide.Who knew the Chipmunks, a late 80s, early 90s cartoon sensation would be popular in 2010. Corey Haim has died at the age of 38 of an accidental drug overdose. So sad. I met Corey at the Horrorhound Weekend of last year, he seemed like he was still battling a drug problem. He will be missed.Yes, we came out of a hiatus for this.